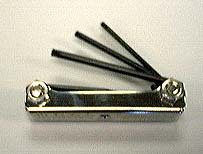 This top quality hex key set is made of chrome nickel alloy steel. It conveniently folds into the handle like a penknife. it snaps into work position when needed. See available sizes below for sets in inches, metric, and fold up torx. Part# Example: See Individual size tables below for inch, metric and torx pocket sets. The same reliability and quality as our standard hex key sets but in a new handle style. The composite grip handle is shaped for superior ergonomics. A soft cusion-grip insert provides comfort and slip resistance. Always, with extra reach keys for safer clearance from your work. Color coded; red for inch, blue for metric, green for Torx®. See tables below for available sets and they sizes of keys contained in each. We also carry the super ergonomic, easy to hold ERGO-FOLD™ style. A combination pack is available containing an Inch, Metric and Torx® set, part#'s 25911, 25171, 25581 respectively.